Artefacts now offers automatic distribution maps, generated from the geographic co-ordinates of the sites mentioned in the occurrences of each file. Two different sort of maps can be created and saved, on a selection of files, or on a single file. In the first case, make your search, from a single word (e.g. "brooch") or, better, from a code (e.g. "FIB-"). 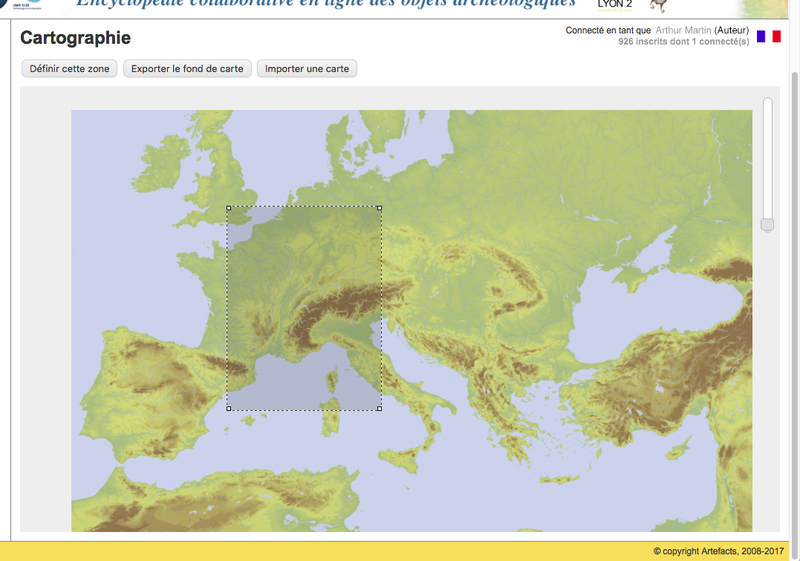 On the top right corner of the first page displaying the results list, three icons leading to different map formats (France and its margins; Europe; Mediterranean basin) give access to the corresponding maps (one click on the selected icon). The selected text is displayed in a corner of the map, and, if necessary, can be placed on an other corner, by a simple click on the new corner. In the second case, open the selected page; the same map icons appear on the top right corner. One click on the selected icon produces the map, this time with a tag containing a type-image and the file name. Just as previously, this tag can be placed on another corner on request. Whichever map is selected, the diameter of the dots is proportional to the number of object at each site; unprovenanced objects (museums) are shown by a white dot. Every map is first displayed in screen definition (72 dpi). Click again on the map to reach an image allowing copy (see below). Once a map is on screen, two buttons appear at the bottom left. 'Carte HD avec provenances' will open a new window (which is longer to create than the former one, be patient) ; the new map can be zoomed (using the mouse scroll) and passing the mouse (without click) on every point will display the site name. This function may be useful to those who want to check a site location, or control the name of every mapped site. 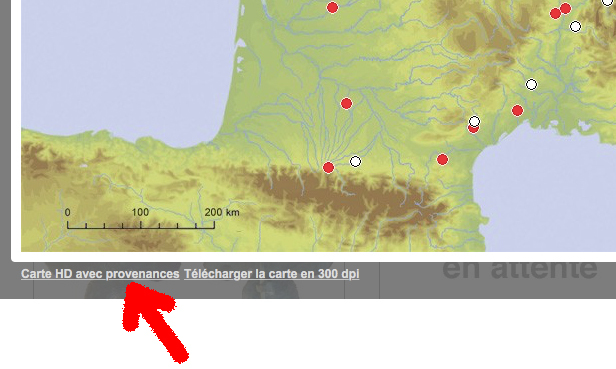 The second link at the bottom left of every map says "Télécharger la carte en 300 dpi" ("Download the map in 300 dpi"). This button will open the same map with a better qhaulity image (300 dpi). Distribution maps open in a new window (pop-up) on the current page. They can be closed either by using the button "Fermer", at the bottom right, either by clicking on the bottom page behind the map. Users needing to copy a map can click it to open the map on a new window. This new map can be copy using the function "Save as..." (right-click). 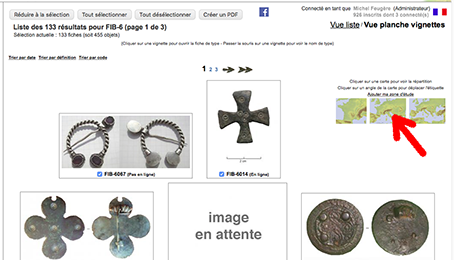 Using Artefacts map is free, including for publication, as long as any image is copyrighted with the mention "© Artefacts".